Mission #115, 02 Mar 1944, to Frankfurt Germany in B-17G #42-97509 Old Hickory 358th BS (VK-A). Lost between initial point and target following an attack by two ME-109s. The #1 engine was on fire and smoking. Crew bailed out over Belgium. B-17 crashed 13 km west of Serinchamps, Belgium (MACR 2864). 2Lt Elder (P), S/Sgts Mirenda (BTG) and S/Sgt Garcia (RWG) - Captured in Antwerp, Belgium after being hidden for two weeks. 2Lt Connors (N) and S/Sgt Swank - Traveled across France and were captured near the Spanish border. 2Lt Burns (CP) and T/Sgt Wilson (E) - Both KIA. The parachute of one failed to open and he fell in the village of Les Basses about 115 km from the crash site. 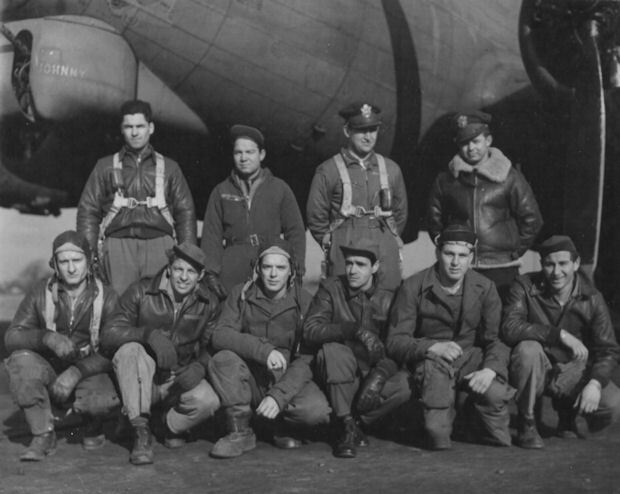 The other crewman's body was found burned inside the B-17 wreckage. 2Lt James R. Burns (CP)(KIA)(8), 2Lt Edward B. Connors (N)(POW)(9), 2Lt Albert W. Stravinsky (B)(POW)(10) and Sgt Norman M. Clark (LWG)(POW)(7) were substitute crewmen on mission #115. Eleven with 2Lt Walter W. Troppman as Pilot 85(A), 87, 88, 89 (Spare), 90 (AS), 91(AS), 93, 95, 98, 101, 102. One with 2Lt Damon C. Elder as Pilot (115). (A) Mission aborted - non (Spare) Returned - non credit (AS) Abortive sortie - Credited Lt Walter W. Troppman flew on 13 combat missions - Two (83, 84) with Lt Calder A. Wise and eleven as a First Pilot.. No record as to why he stopped flying combat missions after 30 Jan 1944. 2Lt Damon C. Elder (P)(POW) - Original Lt Troppman Crewman. First mission #84, 27 Nov 43 as Tail Gunner/Observer with the Maj Kirk Mitchell lead crew. Was upgraded from CoPilot to Pilot on 04 Feb 44. The Elder crew was formed between 04 Feb 44 and 10 Feb 44 when crew photo was taken. Flew only one mission, #115, 02 Mar 1944, as First Pilot. 2Lt Samuel Minkowitz (N)(INT) -Original Lt Troppman Crewman First two missions (83, 84) with Lt Calder A. Wise. Flew 11 missions with the Lt Walter W. Troppman Crew and 13 Missions with other Pilots - 10 as a Lead Crew Navigator. Last two missions with 2Lt Raymond Hofmann as Pilot. On 24 Apr 1944, mission #140 to Oberpfaffenhofen, Germany, the Hoffman Crew, in B-17G #42-31669 Shoo Shoo Baby 358th BS (VK-J) flew to Switzerland and were interned. Capt Charles C. Armstrong (B) - Mission 83 & 84 with Lt Calder L. Wise. Eleven missions with the Lt Walter W. Troppman crew. Did not fly with Lt Elder on mission #115. Flew 20 missions with other Pilots - 19 as a Lead Crew Bombardier. Promoted to Captain on 24 May 1944. Last mission #187 on 21 June 1944. T/Sgt David L. Wilson (E)(KIA) - Original Lt Troppman & Lt Elder Crewman First two missions (83, 84) with Lt Calder L. Wise. Mission 106 with the Major Shumake lead crew. Ten missions with Lt Walter W. Troppman. Last mission #115, 2 Mar 44, with Lt Elder. T/Sgt Daniel F. Gilmore (R)(POW), S/Sgt Frank J. Miranda (BTG)(POW), S/Sgt Mario C. Garcia (RWG)(POW), S/Sgt Verden D. Swank (TG)(POW) Original Lt Troppman & Lt Elder Crewman. First two missions (83, 84) with Lt Calder L. Wise. Mission #99 with a lead crew (Capt Lemmon -P & LtCol Voorhees -CP). Ten missions with Lt Walter W. Troppman, Last Mission #115, 2 Mar 44, with Lt Elder. Sgt Norman M. Clark (LWG)(POW) - Substitute Lt Elder crewman mission 115 Flew 3 missions with Lt Walter W. Troppman (101, 102). Mission #106 as a lead crew Waist Gunner (Maj Shumake & Lt Gamble) The Lt Troppman Crew flew with other Left Waist Gunners on missions 85, 87, 88, 89, 90, 91, 93 & 95. 2Lt James R. Burns (B)(KIA) - Substitute Lt Elder Crewman mission 115. Five missions (90, 91(AS), 97, 101, 103) as a Lead Crew Tail Gunner/Observer. Six missions (106, 109, 110, 111, 112, 113) with Lt Jack W. Watson. 2Lt Edward B. Connors (N)(POW) - Substitute Lt Elder Crewman mission 115. Missions 106, 108, 109, 110, 112, 113 with the Lt Jack W. Watson Crew. Mission #111 with the Lt Marshall Smith crew. 2Lt Albert W. Stravanski (B)(POW) - 12 Missions with other Pilots: 86(AS) with Lt Lester A. Lake; 88, 91(AS), 94(AS), 95(A), 97, 99, 100, 102, 103, 104, 105 with Lt Arnold S. Litman. Last mission #115 with 2Lt Damon C. Elder.